There is two Asefa Estudiantes this year. The one squad of the doubting and dependence, and the one of exhibitions. The ten thousand attendance of this Saturday evening had a bit of the two. That is going to be enough for some games, like today's agains Blusens Monbus. CLUBESTUDIANTES.COM.- Visitors Blusens Monbus had the grip of the game while the shooting efficiency was high enough. The cold of the day got inside the shorts of local players and froze the ideas to a distastrous first ten minutes. Nevertheless, a confortable 10-0 start due to Carl English promising start. Blusens knew there is one weak point at Estudiantes defensive balance: the corners and sides of forwards' defense. This is going to be critical against playoff teams although not today. Corbacho, Bufford and Luz brought the doubts and shiver to the crowd. For more than two quarters there was little to mention but five strong scorers. Though, the fear at the local side caused by only English and Gabriel finding the way. 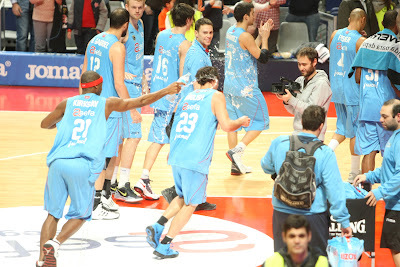 20-23 and Txus Vidorreta had to stop it. Who remembers the online shooting game where you could bash Bin Laden's liquor store? It looked like Corbacho had entered a password to massacre local basket. No matter the corner, he always found one extra metre away from his defender. Two games on three Asefa Estudiantes had conceaded too many 3-point shots. After a mere 40 point scoring Blusens Monbus had already clutched eight. One could see faces of desperation at local aficionados. Second half began and somebody decided to rewrite the plot. A technical fould to visitor (and declared Asefa Estudiantes fan) coach Moncho Fernández gave a weird two-and-ball start for Asefa Estudiantes. The script also said one of the two metal rings had gone narrower. And Blusens stopped that extenuating efficiency at the 6.75 line. For a pretty first time of the evening, the school kids were on the cloak and dagger: Granger, Clark, Nogueira screwed the bolts to the visitor decaying defense. English connected to Bebé Nogueira (will we enjoy his game for long?) and a roar of satisfaction flooded the court. Kirksay, Gabriel and Captain Canada got the flowery disguise and started a 32 point scoring quarter. Granger opened ip the can. Three pointer from well beyond the line. Although Hummel wanted to show a sort of reaction, it came minute 36. English gets a 2+1. Corbacho fails at the shooting lottery and the ball goes again to English. Bingo. And again and again to finish with a probable MVP. Despite the fact that only six men scored, Carl English figures were an outstanding 20/26 shooting, 9/9 af FT, 6/11 from the outside arch, 6 rebs and 7 fouls received for a 39 point career-high and a value league 43 total. Will you miss next week chapter of old day's battle against the rich boys? ASEFA ESTUDIANTES 89 (20-20-17-32) Fisher 0, Fernández 0, Clark 0, Granger 10, Gabriel 13, Kuric 0, Vicedo 0, Guerra 0, Kirksay 10, English 39, Barnes 9, Nogueira 8. BLUSENS MONBUS 66 (14-26-11-15) Hummel 9, Rodríguez 3, Pumprla 0, Sanz 3, García Stobart 0, Dewar 9, Kendall 6, Junyent 5, Corbacho 21, Buford 3, Mejri 4, Luz 3.